In the 1830s, a route was marked and cleared from the Kelmscott region south east to King George Sound, (now Albany) and was to be known in time as the Albany Highway. At the same time, a road was taken from Kelmscott south to Pinjarra, and later Bunbury. The Bunbury Road was to become the South West Highway. Sandalwood was discovered east of the jarrah forests and a thriving trade was established to Asian countries. The sandalwood cutters laid down a trail from east of the King George Sound track, along the Gooralong Brook through what is now Jarrahdale, then across to the coast for export. From the 1830s to the 1850s, settlers holdings were established north, east and south of the present Jarrahdale townsite, and the settlers produced wheat, sheep and vegetables. John Giblett purchased Cockburn Sound Location 58 on the Gooralong Brook and employed Joseph Batt to build a flourmill, which became known as Batt’s mill. Local settlers brought their wheat there and the sandalwood cutters left wheat there on their way to the coast, and picked up their flour on the journey back. In 1862 the South West of Western Australia, including the Gooralong Valley, received torrential rains, in what was known as the Great Flood. It is calculated that the present site of Jarrahdale would have received about 650mm of rain (about 26 inches) over four weeks. A timber rake in the Jarrahdale bush. An approximate total of 450 km of railway was laid down and removed from the Jarrahdale Timber concession before the advent of motorised transport in the 1940’s. From 1870 to 1997 ownership of the timber mills changed 10 times with 11 name changes including a reversal to Millars Australia Pty Ltd. The first timber mill, a 2 storey structure, was erected on the banks of the Gooralong Creek in Jarrahdale May 1872, and by the terms of the lease a wooden railway was built between Jarrahdale and Rockingham, a distance of 23 miles, (about 38 ks) and the first of three jetties constructed soon after. Then, as soon as the 80 metre long, deep sea jetty was completed, the first ship, the ‘Northern Star’ berthed to take on timber for Melbourne. Thus the timber industry was born in Jarrahdale and port facilities established at Rockingham. The first heavy duty mechanical device, the Thompson Road Steamer, was imported to assist in hauling the heavy mill equipment to the site at Jarrahdale, and was then to become the first loco on the line. Soon after, a true locomotive, the Governor Weld, was used to haul the timber trains, and in time, new locomotives, Pioneer (with a tall funnel) and Samson No 1 (with a balloon chimney), Samson No 2 and Jarrahdale were purchased. In the early days, most of the log hauling was done by horse or bullock teams supplied by settlers from farming areas. The logs were brought to the log landings where they were placed onto the trains which took them to the mills for processing and from there the cut timber was taken to Rockingham for export or north by lighter to Fremantle for the local market. The wooden rails of the railway (or, more correctly, tramway) caused a great deal of difficulty because they were unable to take the weight of the heavy locos, so they were replaced by new iron rails over a period of years commencing in c1877. The forest was an impressive sight with its huge jarrah trees and watching the mill in operation was an awesome experience. Eighteen timber mills were built over 120 years and up to four mills operated simultaneously; many were destroyed by fire and rebuilt. During that period, there were four upgrades to mechanization in the mills. Initially the location was known as ‘Jarrahdale Station, The Serpentine’ and to the locals as Jarrahdale Village. Jarrahdale developed steadily and by the mid-1870s, fifty houses had been built as well as a materials store and workshop supporting the mill, plus a school for the town. Some recreational facilities were established including a library. The company gave workers timber cuts to build their houses which were usually roofed with shingles. They built on the company’s land and no rent was charged until early in the twentieth century. Workers resented it, as they could not buy the land. Working conditions were demanding, twelve hour days and six day weeks with unpaid leave at Christmas. There were some financial difficulties with the Company which again changed ownership in 1876, but increased demand for timber in the late 1870s developed into boom conditions in the early 1880s. A telegraph office was established north of Jarrahdale Road, a second mill, the Number 2, was built on Wongong Brook, the loco, Pioneer, was purchased and later Samson No 1, a second jetty was constructed at Rockingham and 130 men were now employed, earning from 6 shillings to 16 shillings a day according to skill. The Rockingham Jarrah Timber Company in this decade, made various approaches to the Colonial Secretary, Malcolm Fraser, to have constructed a through railway line from Rockingham to the 36 mile Police Post on the Albany Road. This proposal, plus another to extend the link even further east to connect it with the Beverley – Albany line, was rejected. Jarrahdale continued to flourish, population by the mid-1880s being about 400 people, 180 being employed by the Company. A Mechanics Institute was built, as was Crock’s Hall, named after Mr Crock who built it. Sporting competitions such as log chops and dances were organised by the community. Musical entertainment was well established and the annual picnic to Rockingham had become an institution. An excursion by train of mill workers and their families to Rockingham is recorded as early as Foundation Day on the 2nd June 1879 which marked 50 years since settlement. 1884-85 were difficult years; the mill was briefly closed in 1885 although 36 ships were still loaded with timber at the Rockingham jetties and a resumption of business saw 200 men employed. In 1887 the original No 1 Mill was burnt down. It was quickly rebuilt as a single storey building, and during this time, as an upgrade of machinery took place, all but 40 men were retrenched. In 1888 a petition by the timber workers to William Paterson JP stated that they had been only partially employed for 15 months and many men were unemployed. In 1886 the Murray Arms Hotel was opened in a building owned by The Rockingham Jarrah Timber Company that is thought to have been a boarding house at the time and prior to that the mill manager’s residence. The company who had previously opposed the sale of alcohol, applied for a licence when local resident, Peter Lewis, unsuccessfully tried to get one. In the 1890s, conditions were extremely favourable. Boom years commenced with the discovery of gold, population increased dramatically and timber for housing was in great demand, over 7,000 tons being shipped from Jarrahdale in 1890 alone. In addition, much timber from Jarrahdale was used as paving blocks for the streets of London, Glasgow, Paris, Melbourne and other cities. In 1892 the timber company was again reorganised and renamed the Rockingham Railways and Jarrahdale Forests Company while in 1893, the government Bunbury – Perth railway was completed, and intersected the Jarrahdale – Rockingham Company line at what is now Mundijong, but was then known as Jarrahdale Junction. At Jarrahdale Junction, a huge timber stockyard was developed, a stockpile for timber railed to the coast at Rockingham or north to the fast developing metropolitan area. Because of a shortage of government rolling stock in this period of high demand, the Company trains were, at times, to take timber to Perth on the government line. There were 60 miles of railway constructed and utilized for the timber company, lines to haul the logs to the mills and to take feed to bullock and horse teams working on the bush landings. The Company, too had undergone a change of ownership and was after 1897, known as the Jarrahdale Jarrah Forests and Railways Ltd.
By the 1900s, Jarrahdale had a town population of about 1200 people while 800 more were housed in surrounding bush landings and remote sites. Workers’ wages varied according to skill; they worked a 54 hour week and this decade saw the great whims, used for log hauling, now in common use. However at this time, hardship developed because of a proliferation of mills in other areas and competition between companies. The whole industry was to experience a major overhaul in 1902 with the amalgamation of eight major saw milling companies under the one name of Millars Karri and Jarrah Company (1902) Limited. At this time, other important developments took place and included a decision (following a request by the company to the Fremantle Harbour Trust to deepen the channel at Mangles Bay, a request which was denied) to scale down shipments of timber via the rail route to Rockingham. Consequently there were reduced shipments from Rockingham until by 1907 and 1908, only one ship per year had operated. Bunbury was to become the state’s major timber export port. Jarrahdale Junction was renamed Mundijong and the depot became an important consolidation point for the forwarding of timber to Perth for the local market. The mill at Jarrahdale was burnt down in 1901 and not rebuilt until 1912-13. Jarrahdale lost some of its importance as the two large mills at Big Brook, Numbers 5 and 6, took prominence from the turn of the century until 1912 – 1913, being enlarged in 1902. Big Brook, which housed the mill workers and the bush workers grew quickly to maintain a sizeable workforce and an overall population of about 1,000 people. At Big Brook there was a village green a sports ground, a cricket ground, tennis courts, hall for entertainment, shops and a school, which in 1908 had 118 children on the roll, two pools in Big Brook were used for swimming (one for men and one for women). Circuses and troupes travelled to Big Brook. The wages in 1907 were recorded as being seven shillings and sixpence minimum per day, but grievances held by the men over hours, wages and working conditions led to what was termed the Timber Workers Strike in1907. The strike spread over all the mill towns, lasted 14 weeks and caused much hardship before the matter was resolved. The No 5 Mill was operated by management using office and staff from various locations; these ‘blacklegs’ aroused a mixture of anger or amused tolerance and on one occasion were attacked by a few umbrella wielding wives of the strikers. In 1910 the No 6 Mill was destroyed by fire, then rebuilt, while at this time the powerful Steam Haulers were introduced – highly effective machines for log hauling – but so expensive that only the big mills could afford them. However, the days of the settlement at Big Brook were numbered; two new large mills were built back in Jarrahdale, the big Number 1 (a huge mill with 28 benches) and a new No 2, built end to end with No 1. 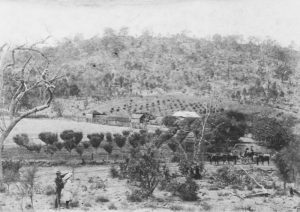 The Company planned and constructed a new town, named New Town, east of where the original settlement took place and moved the workers, their families and many of their houses by rail, back to Jarrahdale, employing the Big Brook workers in the new mills. The greatest output was prior to World War I when timber was the ‘glamour industry’ of Western Australia. Jarrah was exported to many countries including India, South Africa, China, America, New Zealand, England, Egypt, and Europe. Millars’ Karri and Jarrah Company (1902) Limited produced 10 million cubic feet of hardwood every year. Timber was used for underground mining, cable poles, harbour and dock works, pier and bridge construction, sleepers, street paving and many fine buildings throughout the world. The outbreak of World War 1, 1914 – 1918, saw about 200 men from Jarrahdale enlisting; 41 died and their names are inscribed on the town War Memorial. However, more than that number died on service. If they did not enlist at Jarrahdale their names were not permitted to go on the memorial; it is a regulation that exists today. The output from the mills was much reduced during this period but increased activity took place after the war when there was a demand for railway sleepers, paving blocks and building timber, occasioned in part by the visit of a French trade mission under General Pau. At this time, also, there was a large number of Italian families who came to live in Jarrahdale. Only a few were employed in the mill, most became railway gangers. The Mechanics Institute built in 1914, was used by the community until 1982 when the Bruno Gianatti Memorial Hall replaced it. The 1920s saw the destruction by fire of the No 2 Mill, the closure of the Roman Catholic school in 1929 and the recently opened Bush Landing School while the Jarrahdale State School numbered 150 children on the roll. With the onset of the Great Depression both mills were closed and many men were unemployed. In December the timber lease or concession expired so the Company was hit by extra charges, mainly in the form of timber royalties plus higher costs as trade dropped. The Millbrook Hotel closed during the Great Depression, reopened in 1936 and closed for good in 1938. Many families left the town looking for work elsewhere. In 1932 Jarrahdale hospital became a public hospital and also had a maternity ward. Conditions started to improve by 1935 as the Depression lifted, the No 2 Mill was re-opened and by that time mechanisation took place in the bush. The ‘Crawler’ logging tractor was introduced, 30 hp ‘Holts’, then Caterpillars and tractors replaced the horse teams, and log hauling trucks became important. During World War II, 1939 to 1945, despite lowered demand the mill remained opened, although in 1943 the No 2 Mill was burnt down and another mill built on the site of the old No 1 Mill while soon after the old railway was replaced by heavy log hauling trucks. The railway line from Mundijong to Rockingham would be pulled up in 1950. Disaster struck again in 1949 when the Number 1 Mill was destroyed by fire but quickly rebuilt, thus making the new mill the fifth No 1 Mill! By the late 1940s, the first power saws, mobile circular and cross cut saws (petrol driven) were operating. The machinery at the mills before this had been steam driven. the closing of the last timber mill in 1997. The Company had become Millars Australia Pty Ltd in 1970 and were finally to sell out to Bunning Bros in 1993. The National Trust (WA) classified Jarrahdale as a Heritage Town in 1997.